San Carlos to the US Border « R-V There Yet? To be truthful, if you have made it south as far as San Carlos, the condition of the roads will only improve as you head farther south. That said, we had heard reports from people that headed north ahead of us, that the road condition from San Carlos to the border was littered with huge potholes. Apparently the word got out and road crews have filled the potholes in all but a few stretches. It still is one of the bumpiest rides that we have experienced. It was bumpy enough that our microwave, which sits in a rather well engineered bracket and is held on place by a frame screwed to the cabinet, showed evidence of abuse. The frame had been jarred by the jumping microwave and snapped the plastic around the screws, leaving the screws and plastic rings in the wall and the frame on the floor. One leg of the microwave was sitting on top of the bracket. The clearance is so tight that it is extremely difficult to get the oven out of its bracket when that is your intent. We need to order a new frame to replace the broken one. Between San Carlos and Hermosillo recent activity has closed off stretches of the road for actual resurfacing from scratch, not just patching. From KM 61 to KM 69 was one of the largest being worked on and we shared the northbound lanes. 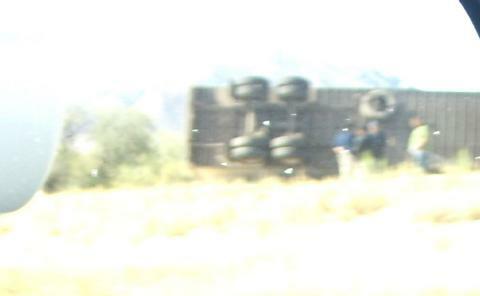 We witnessed the aftermath of a truck rollover in the southbound lanes. It is quite amazing the way traffic reroutes itself without the assistance of law enforcement or emergency personnel. All of a sudden, we noticed southbound traffic heading our direction in the left hand lane. It is really a rather efficient way to operate. 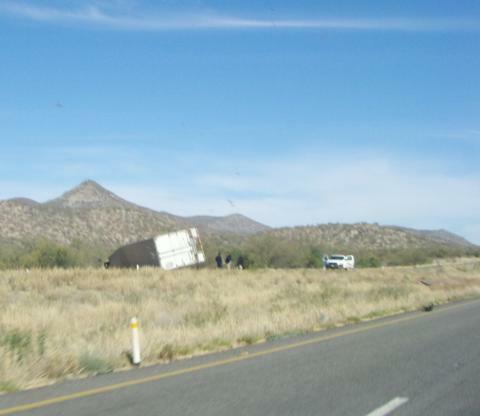 Traffic that is being blocked simply crosses the median and continues traveling until they pass the accident. We left San Carlos at 7:30 AM and by 9:30 we were approaching Hermosillo. 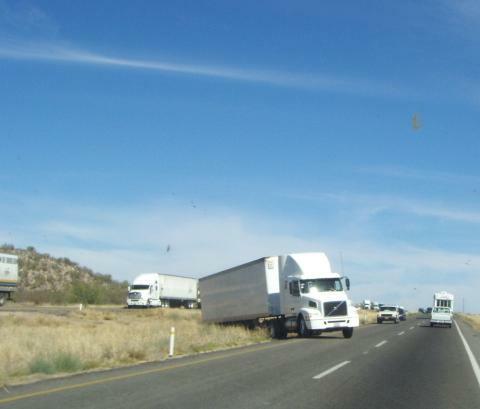 The traffic in Hermosillo was quite heavy but kept moving. There is a stretch of Hwy 15 that follows city streets and there are unmarked topes (speed bumps) waiting for you. Fortunately, we spotted them all. There are also a few critical turns that, if missed, could cause delays. Generally, the road is marked quite well. The spot where southbound traffic stops to pick up their permits known as KM 21 checkpoint and is quite busy in the mornings, but by noon it is nearly empty. Northbound, this is the point where we turn in our vehicle permits. It is important to do this because if you don’t, it could make it impossible to enter on a return trip. 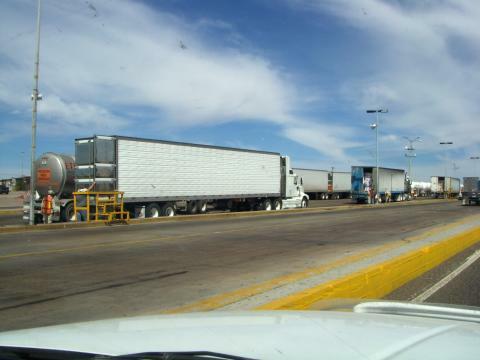 We parked just north of the permit point so that we could cross the road to the Southbound checkpoint to go the bank to trade in our pesos for dollars. 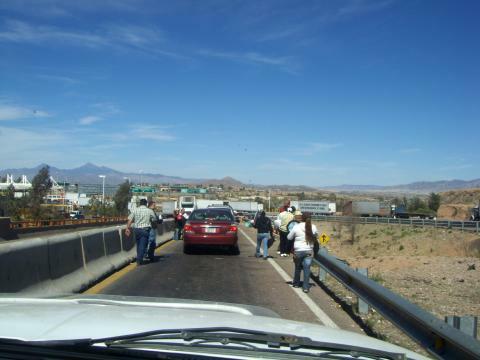 As we approached the border, we came up over a rise and were greeted by a line of stopped vehicles on the downhill side. 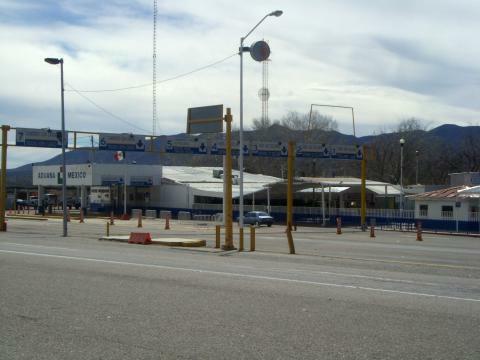 Reduce speed when within a few kilometers of the US custom and immigration checkpoint. There are truck lanes and auto lanes. 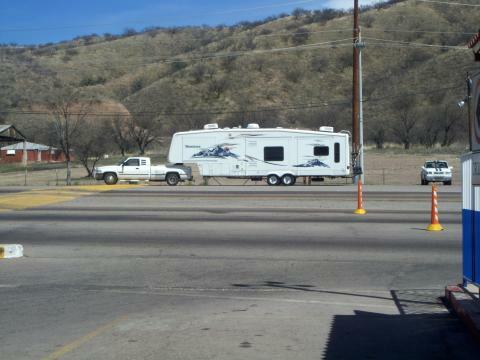 If you are in an RV, be sure to get into the auto lanes. Signage will eventually get you in the proper lanes. 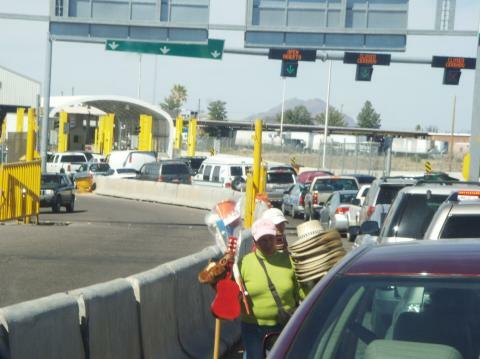 This picture was taken when we got into line at the border. From this point, it took two hours to clear immigration and customs. Guess what we encountered next, yep you got it, more vendors. Unlike the beach vendors, these vendors realize that they only have one chance at you and are a little more aggressive. This continued all the way to the border. We only opted for a windshield wash. We picked a guy with both a soap bottle and a rinse bottle. He did an excellent job. Once we reached the checkpoint, immigration was a snap. We were directed to head to a customs waiting area for inspection. We were, of course, truthful and mentioned our two bottles of tequila. Since our refrigerator was broken, we didn’t have to worry about much in the way of food, but did fess up to having some eggs. The inspector peered into our warm refrigerator and ignored the few cans of beer and snagged our eight eggs. By the way, fines begin at $300.00 for contraband items, if they find them and you didn’t declare them. 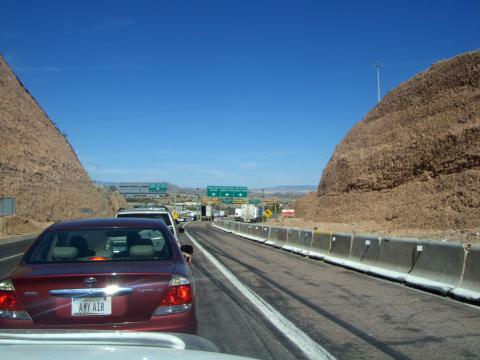 After two hours, most of it in line, we were on our way toward Tucson and smooth roads. We spent our first night back at the DeAnza Trails RV Resort near Green Valley, just south of Tucson. We had made our reservations online and check-in was a snap. We would recommend this stop. For some reason, the water hookup is on the wrong side of the rig, but well within hose reach. This entry was posted on Friday, March 21st, 2008 at 3:24 pm and is filed under Arizona, Mexico, Mexico - Hermosillo, Mexico - Nogales, Mexico - San Carlos. You can follow any responses to this entry through the RSS 2.0 feed. You can leave a response, or trackback from your own site.